If you have been receiving cherries from Washington State, you have no doubt come across this defect, fresh cracks. These cracks are caused by rainy weather while the cherries are still growing on the trees. This year, the rains came while the cherries were getting ready for harvest. The extra moisture forces the cherries to split or crack, usually opposite the stem end. If the wet weather occurs earlier on, before the cherries are ready for harvest, the cherries may crack near the stem cavity, and will actually heal, leaving a small, but dry radial scar. Those healed cracks may still be considered a defect, but are a quality defect, meaning the crack will not progress, become worse or turn into decay. The cracks pictured above are not quality defect, but because they are considered as being fresh (not healed) the defect is classified as a condition defect. Any crack found being “not well healed” is considered a defect. There is no scoring guideline, allowing a certain length or depth for the crack. Simply put, if you find a crack that is not well healed, any size, anywhere on the cherry, it is scored as a defect, as serious damage. Not more than 2% decay. So as you can see, the total amount of defects allowed (such as scars, pitting, discoloration, etc.) is double for cherries from Washington State, 24% total defects as compared with 12% total defects. But if you are finding these growth cracks in Washington State cherries, they would still fail to grade if the total tolerance for serious damage exceeded 7%, while only 6% is allowed for serious damage for cherries grown outside of Washington State. And lastly, after looking at both cherries in the image above, would they be scored as defects? 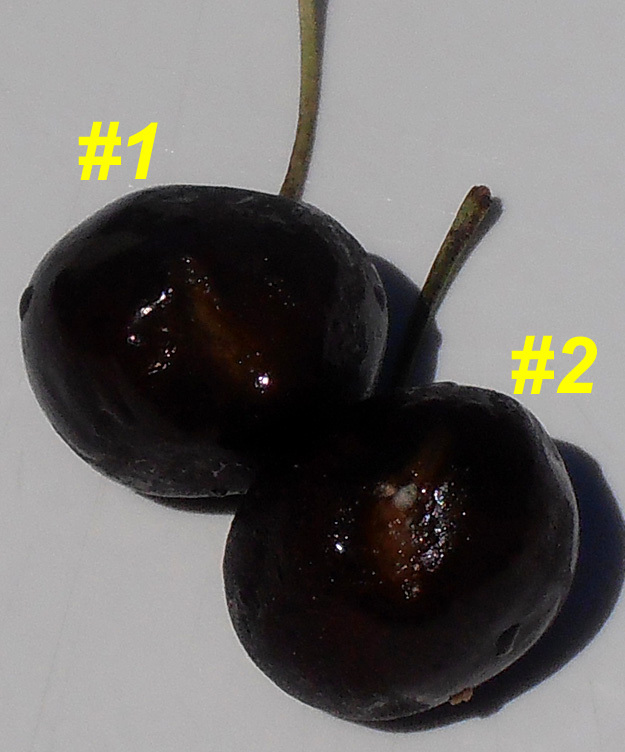 Yes, both cherries would be scored as serious damage by “fresh cracks,” but cherry #2 would be scored as decay, as you can clearly see the mold growth within the fresh crack. If the cracks do not dry up, the moisture and high sugar content provides a great environment for molds to develop. Always remember to look closely within the cracks for any signs of mold or decay. The correct grade would be Northwest No. 1. Also Washington No. 1 is the grade that is generally used although grade is not a required marking. Thanks for the comment Rocky! Much appreciated.